Cooley (1902) introduced the looking glass self as an individual’s self-concept defined, in part, by societal heuristics. Silvia and Phillips (2013) showed self-awareness (SA) was influenced by presenting stimuli that both explicitly increase SA (e.g., mirrors) and implicitly increase SA (e.g., name priming). Objective SA theory, coined by Duval and Wicklund (1972) and updated by Silvia and Duval (2001), stated SA could occur without explicit stimuli (Silvia & Phillips, 2013). Research has not yet addressed this prediction. The current study assessed the impact of increasing explicit SA on self-esteem by administering an adapted version of Rosenberg’s Self-Esteem Scale (RSES; Rosenberg, 1965) on reflective or non-reflective surfaces. 120 undergraduate participants (60 M, 60 F) were selected using purposive sampling and randomly assigned to complete the RSES on one surface. Attention was drawn to surface-type and responses were provided to RSES questions. 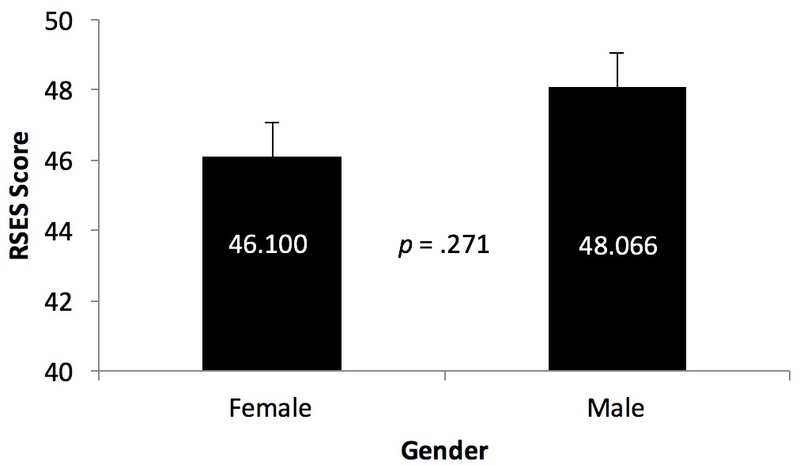 A two-way ANOVA showed no difference in RSES scores by surface (p = .348) or gender (p = .271). These findings show the presence or absence of a reflective surface does not impact self-esteem, thus, the reflective surface did not influence SA. These results either suggest that SA does not directly impact self-esteem or the possibility of a need to find an alternate way of manipulating SA prior to assessing self-esteem. Self-esteem is defined in many ways, often varying by individual and situation. For the purpose of the current study, self-esteem is defined as feelings about oneself based on the presence of implicit or explicit stimuli and self-perception is defined as the way an individual perceives themselves in the presence of these same implicit or explicit stimuli. The current study assessed the impact of increasing explicit self-awareness using an adapted version of the Rosenberg Self Esteem Scale (RSES; Rosenberg, 1965) printed on either a reflective (i.e., mirrored) or non-reflective (i.e., non-mirrored) surface on individual RSES scores. The purpose of the reflective surface was to increase self-awareness. Cooley (1902) introduced the looking glass self as an individual’s self-concept defined, in part, by societal heuristics. Cooley used the old English term for mirror, the looking glass, as a metaphor to describe an individual’s reflection of themselves in terms of their social self (Shaffer, 2005). Cooley’s idea of the looking glass self is explained in two steps, (1) we imagine how we appear to another person, and (2) we imagine how the person feels about us, based on the judgments made (Cooley, 1902). Although, in the current study, self-esteem was evaluated individually, the presence of the mirror as an explicit stimulus provided a basis for participants to reflect on their own appearance. This self-reflection may have been contributed to by society. Upon examination of Cooley’s theory of the looking glass self, Thomas Scheff developed a theory of emotions based on Cooley’s work (Scheff, 1985, 1988, 1990, 1993, 2000, 2003). Scheff (1988) coined this theory the Cooley-Scheff conjecture. The Cooley-Scheff conjecture provided that one’s current emotional state was at least partially defined by how the individual felt assessed by others (Shaffer, 2005). Most research done on male and female behavior in regard to self-esteem suggests male self-esteem is, on average, higher than female self-esteem (Kling, Hyde, Showers, Buswell, 1999). Because of these findings, the participant variable of gender was examined in the current study. Objective self-awareness theory (Duval & Wicklund, 1972; Wicklund & Duval, 1971) represented the inception of the social psychology of self-awareness. Objective self-awareness theory takes into account the consequences of focusing attention on the self (Duval & Wicklund, 1972; Wicklund & Duval, 1971). The most common results of self-focused attention are, (1) conscious awareness can be established by directly focusing attention on oneself, and (2) when individuals experience this sense of conscious awareness, they begin to experience a sense of self-consciousness (Silvia & Gendolla, 2001). Placing an individual in front of a mirror is a common way to manipulate self-focused attention and, in turn, create conscious awareness of oneself (e.g., Carver & Scheier, 1978). The current study aimed to create a state of conscious awareness where self-focused attention was promoted via the use of a reflective surface. In empirical research, self-esteem is often quantified (McLeod, 2012). The current study assessed the impact of increasing explicit self-awareness on self-esteem by administering an adapted version of the RSES (Rosenberg, 1965; see Appendix A) on reflective or non-reflective surfaces. The RSES is one of the most widely used self-esteem scales in the social sciences (University of Maryland, 2015). For the purpose of the current study, the RSES was adapted from a 4-point to a 7-point Likert scale with options ranging from strongly agree to strongly disagree and including a neutral option. Scoring was extrapolated from the original RSES, which had a total of 30 points with scores above 25 indicating high self-esteem and scores below 15 indicating low self-esteem. Scores on the adapted RSES ranged from 0-60 with scores of 50 and above indicating high self-esteem and scores below 30 indicating low self-esteem. The independent variable of surface-type had two levels which were participant’s completion of the RSES on (1) a reflective surface or (2) a non-reflective surface. To reproduce the looking glass effect, it is best to test naturally occurring groups where self-esteem is malleable (Cast, Stets, & Burke, 1999; Ichiyama, 1993). In the current study, undergraduates from a small liberal arts college were chosen via purposive sampling and placed in randomly assigned surface-type groups. The dependent measure was the participant’s self-esteem score as measured by the RSES. The participant variable of gender (male, female) was also considered. Based on previous research regarding the looking glass self (Cooley, 1902), objective self-awareness (Duval & Wicklund, 1972; Wicklund & Duval, 1971), self-focused attention (Silvia & Gendolla, 2001), and the impact of explicit stimuli on self-awareness, it was hypothesized that (1) individual self-esteem would be impacted by the presence of an explicit stimulus during completion of the RSES, and (2) overall, female RSES scores would be lower than male RSES scores. The independent variable of surface-type was achieved using either (1) reflective paper or (2) non-reflective silver paper. The RSES was printed on transparency film and trimmed to 6 in (15.24 cm) x 9 in (22.86 cm). The transparency film was placed on top of the reflective or non-reflective paper and inserted into a vinyl envelope. The goal of the surface-type variable was to effect participant self-awareness during participant completion of the RSES. The dependent measure was the participant’s self-esteem score as measured by the RSES. Gender was also considered. One hundred twenty undergraduates (60 males and 60 females) were selected via purposive sampling from a population at a small liberal arts college. The participant variable of gender necessitated that male and female sample sizes be equal. Participants were randomly assigned to surface-type using Excel's random number generator. Participants received research credit as compensation for their participation. Following informed consent proceedings, participants were (1) provided with a reflective or non-reflective RSES surface and an Expo Low Odor Fine Tip Black Dry Erase Marker, (2) asked to carefully examine which type of surface they received (i.e., reflective or non-reflective), and (3) completed the gender question and ten RSES questions. Following completion of the RSES, participants were asked to place the RSES upside down in front of them and wait for collection. Participants were then debriefed and thanked for their time. After the debrief, the researcher took a photo of the completed RSES with an Apple® - iPhone 6 - 16GB – Gold. To ensure participant confidentiality, the iPhone was password protected. Following data collection, photos of the 120 completed participant RSES’ were printed, scanned, and saved to a password protected computer. Hard copies of participant RSES’ were shredded to ensure confidentiality. See Appendix B for a complete list of materials. Participant RSES scores were sorted according to paper surface-type (reflective average = 47.84); non-reflective average = 46.32) and gender (male average = 48.06; female average = 46.10). A two-way ANOVA (α = .05) was used for the purpose of comparing differences in RSES means across surface-type and gender. This analysis showed no significant difference in RSES scores as a function of surface (p = .348; see Figure 1, Appendix C) or gender (p = .271; see Figure 2, Appendix D). It was predicted that increasing explicit self-awareness through the use of an adapted version of the RSES printed on either a reflective or non-reflective surface would impact overall RSES scores. The purpose of the reflective surface was to increase self-awareness to impact self-esteem. Results indicate self-awareness did not directly impact self-esteem. A methodological issue in the current study was the minimal and relatively uncontrolled time participants spent interacting with their RSES surface-type. Verbal instructions provided to participants did not specify an allotted amount of time for them to interact with their surface-type, rather, the participant was only asked to note which surface-type they received. Because of this, participants may not have had enough time to focus on the reflection that appeared in either of the surface-types. While it was found self-awareness did not impact self-esteem under the current conditions, it is recommended future studies incorporate an activity drawing more attention to the surface to increase attention to self-awareness. Ichiyama (1993) and Cast et al. (1999) argue self-esteem is best tested in naturally occurring groups. Although it is arguable the population at a small liberal arts institution includes naturally occurring groups, the process of data collection in the current study required peers be split into small groups which may have disturbed natural group formation. The current study was conducted at a small liberal arts college and the participants consisted of mostly emerging adults. This pattern of results may differ from those of other age populations. Further research on self-awareness and self-esteem should be conducted with those in a variety of age groups to monitor the progression of any effect over time. An additional suggestion is to examine the role of peers in self-esteem through manipulating this as an independent variable during RSES completion. Cooley’s theory of the looking glass self addresses societal views on how peers impact self-esteem related to intrapersonal/interpersonal discomfort. Self-esteem and self-perception can distort the way individuals see themselves and others. We are bombarded by photo enhanced advertisements and societal standards that, for many, are unattainable. These results indicating heightened self-awareness does not reduce self-esteem may permit individuals to accept themselves for who they are. This may be just what we needed to hear. Carver, C.S., & Scheier, M.F. (1978). Self-focusing effects of dispositional self-consciousness, mirror presence, and audience presence. Journal of Personality and Social Psychology, 36, 324-332. Cast, A.D., Stets, J.E., & Burke, P.J. (1999). Does the self conform to the views of others? Social Psychology Quarterly, 62(1), 68-82. Cooley, C.H. (1902). Human Nature and the Social Order. New York, NY: Scribners. Duval, T.S., & Wicklund, R.A. (1972). A theory of objective self-awareness. Oxford, England: Academic Press. Ichiyama, M.A. (1993). The reflected appraisal approach in small group interaction. Social Psychology Quarterly, 56, 87-99. Kling, K.C., Hyde, J., Showers, C.J., & Buswell, B.N. (1999). Gender differences in self-esteem: A meta-analysis. Psychological Bulletin, 125(4), 470-500. Scheff, T.J. (1985). The primacy of affect. American Psychologist, 40, 849–850. Scheff, T.J. (1988). Shame and conformity: The deference-emotion system. American Sociological Review, 53, 395– 406. Scheff, T.J. (1990). Socialization of emotions: Pride and shame as causal agents. In T.D. Kemper (Ed. ), Research agenda in the sociology of emotions (pp. 281–304). Albany, NY: State University of New York Press. Scheff, T.J. (1993). Toward a social psychological theory of mind and consciousness. Social Research, 60(1), 171–195. Scheff, T.J. (2000). Shame and the social bond: A sociological theory. Sociological Theory, 18(1), 84–99. Scheff, T.J. (2003). Shame and self in society. Symbolic Interaction, 26(2), 239–262. Shaffer, L.S. (2005). From mirror self-recognition to the looking-glass self: Exploring the Justification Hypothesis. Journal of Clinical Psychology, 61(1), 47-65. Silvia, P.J., & Duval, T.S. (2001). Objective self-awareness theory: Recent progress and enduring problems. Personality and Social Psychology Review, 5, 230-241. Silvia, P.J. & Gendolla, G.H.E. (2001). On introspection and self-perception: Does self-focused attention enable accurate self-knowledge? Review of General Psychology, 5, 241–269. Silvia, P.J., & Phillips, A.G. (2013). Self-awareness without awareness? Implicit self-focused attention and behavioral self-regulation. Self and Identity, 12(2), 114-127. Wicklund, R.A., & Duval, T.S. (1971). Opinion change and performance facilitation as a result of objective self-awareness. Journal of Experimental Social Psychology, 7, 319-342. Note. 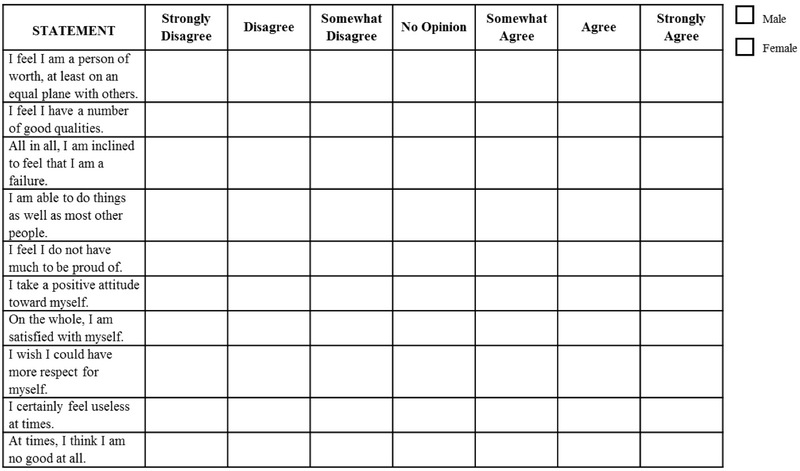 Adapted (4-point to 7-point Likert Scale) version of the RSES (Rosenberg, 1965) used in the current study. Figure 1. A two-way ANOVA showed no significant difference (p = .348) in RSES scores as a function of surface-type. Figure 2. A two-way ANOVA showed no significant difference (p = .271) in RSES scores as a function of gender. Sarah A. Fricke graduated in 2015 with a Bachelors degree in Psychology from Sierra Nevada College in Incline Village, NV. Christina M. Frederick, Ph.D., is Director of Undergraduate Research at Sierra Nevada College.